Caitlin Myler was turning left out of the parking lot of the Ottawa County bank call center where she worked when she spotted another motorist traveling fast over the hill. Their cars collided and the impact of the November 2011 crash changed the course of Caitlin’s life. Her pelvis was broken in several places and her injuries landed her in the hospital for weeks. Once discharged, she remained in a wheelchair for three months, waiting for her body to heal enough to walk again. Unable to work or attend her community college classes, Caitlin decided to pass the time making jewelry. “It totally gave me something to do and something to look forward to and get excited about,” she said. As she recovered, she continued to make jewelry. 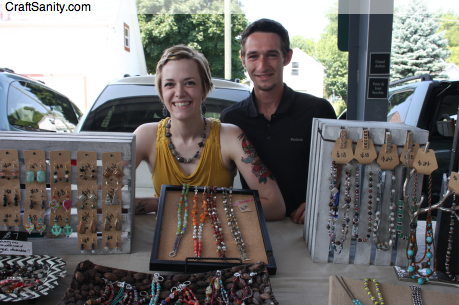 Caitlin Myler, creator of The Lucky Lark jewelry line, and her husband Stephen, sell her designs every Sunday at the Fulton Street Artisans Market in Grand Rapids, Michigan. 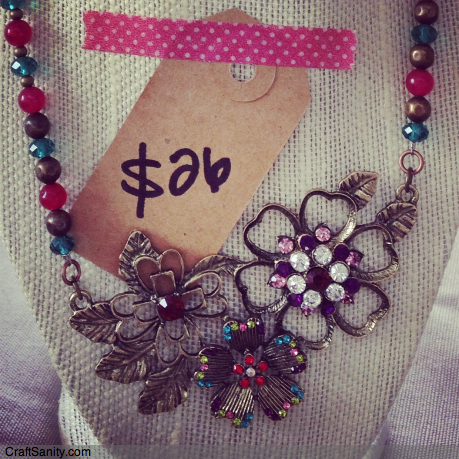 Buoyed by a positive attitude, Caitlin made a full recovery and continued making jewelry. She started selling her jewelry designs online at theluckylark.etsy.com soon after the birth of her son, Carson, now 10-months-old. She said her online sales didn’t really take off until she and started a Facebook page for her business and became a seasonal vendor at the Fulton Street Artisans Market at the beginning of the summer. When she first started vending at the market, she said she would only sell a few pieces. Since then, she has watched sales increase to more than 20 in a single day. Read the rest of Caitlin’s story in my weekly mlive.com column and visit her Facebook page to learn more about her business and upcoming shows. Listen to her tell the story on this week’s CraftSanity Podcast.